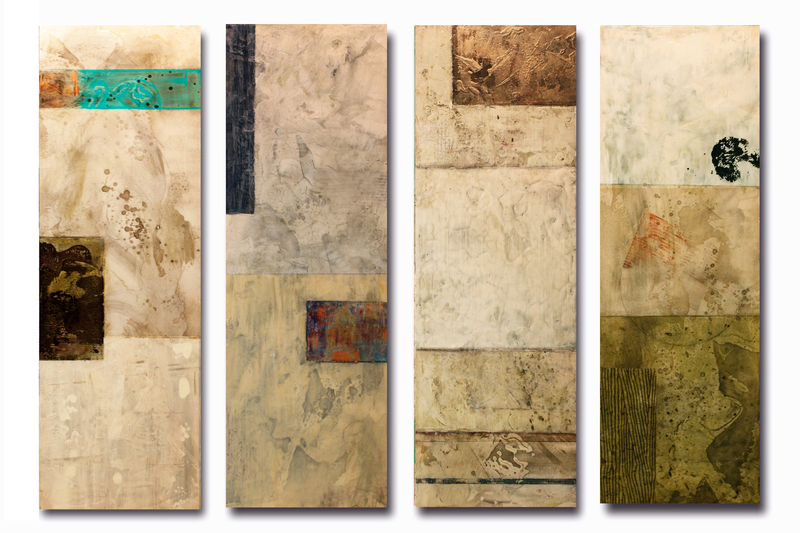 These are the four panels shown in progress in my previous post, now completed and already shipped to the gallery. I enjoyed the process and can’t wait to get started on more. Click on the image for a high-resolution zoom. Enjoy! love these Martha. That size is unusual to work on. Was that difficult at all? Thanks, Pat! No, they were a fun change of pace. I think I’ll do some in other dimensions. Martha these are just beautiful, I’m so glad you carried on after your first post about them. Lovely happy colours and just enough design so that the designs stand out. I hope they find their forever home, someone will be fortunate. So glad you like them, Sandra. I hope they find a good adopter! First comment vanished so I am re-posting. Just beautiful, lovely happy colours, just the right amount of design, and should go with any décor. Some lucky person or persons will get great enjoyment from them. A thought-provoking abstract work. I love the colour synthesis. Thank you very much, Francis. I appreciate your stopping by for a look. I always love this abstract art to be part of my personal art collection. I am an art collector of abstract art. Please visit my personal art collection at Macuha Art Gallery.